Shopping campaigns also known as PLAs (Product Listing Ads) represent a great opportunity for your e-commerce business. Google gives you the possibility to show in the search results the image of your products accompanied to a short description and the price. The immediate result of this kind of campaigns is putting the items you sell in a very attractive spotlight. In this blog post you will see what the main elements which define a Shopping campaign are. Shopping campaigns don’t work with keywords like the classic search ones, they work with product feeds. A product feed contains information about a product which includes the details of an item (For example unique ID, price, product title, product description, image etc. etc.). Product feeds are the foundation of a Shopping campaign and they are collected in the Merchant Center. The merchant center can include information of your in-store inventory as well which is useful when you are running geo-targeted campaigns to target people who are close to your physical shop searching for your products. IMPORTANT: Before starting to upload your product feeds you will be requested to verify the ownership of the website you want to link with the Merchant Center. Having precise and updated product feeds in the Merchant Center plays a big role in the overall success of your Shopping campaign. As a rule of thumb you should update your product feeds at least once a month. If you don’t want to manually update your product feeds and skip this time consuming activity you can pull product data directly into the Merchant Center using the Content API that connects your online store to the Google Shopping’s API. One of the main reasons for the Merchant Center disapproval is the mismatch between the products prices and availability on your feeds and the information contained in the landing pages of your website. So when you update any product info on your website make sure that your feeds are aligned with these changes. Also, when you upload the image of your product in the merchant center remember that images which contain watermarks, prices, offers are not accepted. As best practice you should upload high quality images with a clear white background. Last but not least if you want to run a Google Shopping Campaign you must have a refund or return policy clearly stated in your website and a secure checkout process implemented. The classic ad groups structure of the search campaigns is replaced by product groups. Different attributes (product feeds information) can be used to define/organise a product group, the most common one is the Category, an attribute based on the Google product taxonomy (example: “Apparel & Accessories > Clothing > Outerwear). Structure is a key part to building a successful campaign. A structure that uses relational ad and product group divisions in a tiered, broad-to-narrow structure. This ensures more bid control and coverage, simplifies account management, and creates better visibility into performance. It also ensures that you don’t waste time or money on item IDs or small ad/product groups with little or no activity. Some other attributes that you can use to organise your product groups are Brand (the manufacturer of a product), Product type (an attribute which depends on your category. For example if we consider the category “outerwear” a product type can be “Hand made hats”), Condition (the state of a product, ex. new, used, and refurbished) or Channel (shows where products are sold, either “Local” in a physical store or “Online” through an e-commerce store). You can also use the attribute Custom Label. This piece of information is fully created by you and It’s possible to have up to five custom labels in your product data (“seasonal” or “bestseller” are two good examples of this kind of attribute). 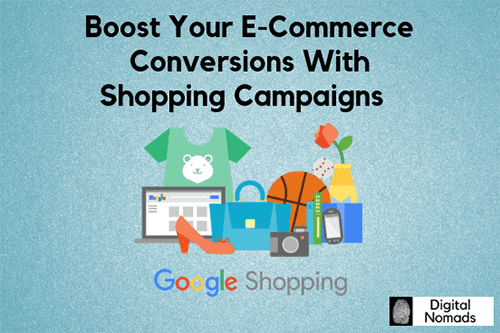 Google has recently launched Smart Shopping Campaigns, the most evolved version of Shopping Campaigns. These campaigns run not only on Google search and the search partners network but also on the Google Display Network (we will talk specifically about this kind of campaigns in a different post). If you opt in for Smart Shopping Campaigns you will be able to take advantage of the Google machine learning technology for your bidding options. In particular you will be able to use the Maximise Clicks, Target ROAS or ECPC option. Maximise Clicks: the system sets the bids to get as many clicks as possible within your budget. Target ROAS, Return On Ad Spend (total revenue coming from advertising/cost of advertising): the system works on bringing in more conversions and meet the ROAS parameters. ECPC: you choose your products bids and then the system readjusts them to get more potential conversions. Differently from the classic search campaigns where the bid strategy has to be set on a campaign level, with smart shopping campaigns you will be able to assign a specific bidding strategy for each of your product group. This is an important setting as Google advanced machine learning, thanks to the elaboration of auction time signals to capture the unique context of every search, helps you to maximise the ROI of your campaign. The advertising budget allocation for Google Shopping campaigns is increasing dramatically with the passing of the time. Studies* confirm that the conversion rate generated by these ads is higher than the common search ads and the cost per click lower. By providing relevant product information the quality of your leads increase as well. If you are about to start your first Google Shopping campaign but you don’t know where to start or if you want to optimise the performance of an existing one but you lack of solutions let’s have a chat! *Adthena, Search Advertising Report Q1 2018 (www.adthena.com).